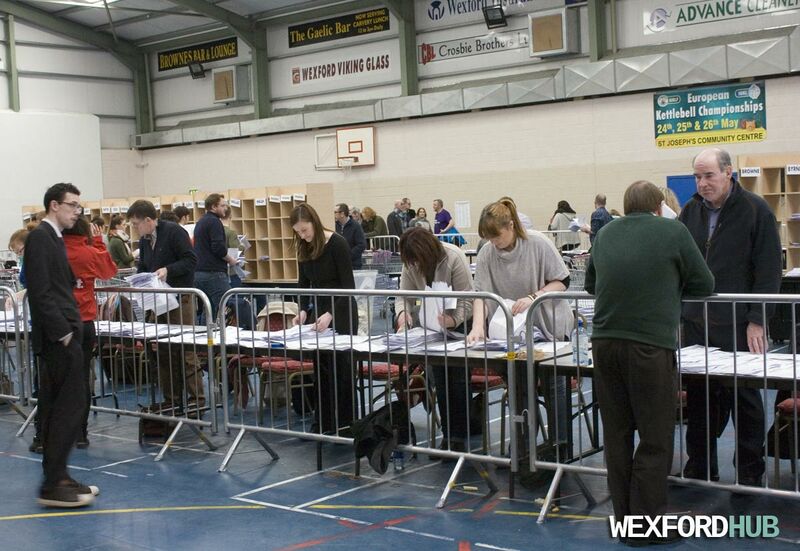 Wexford General Election count centre. 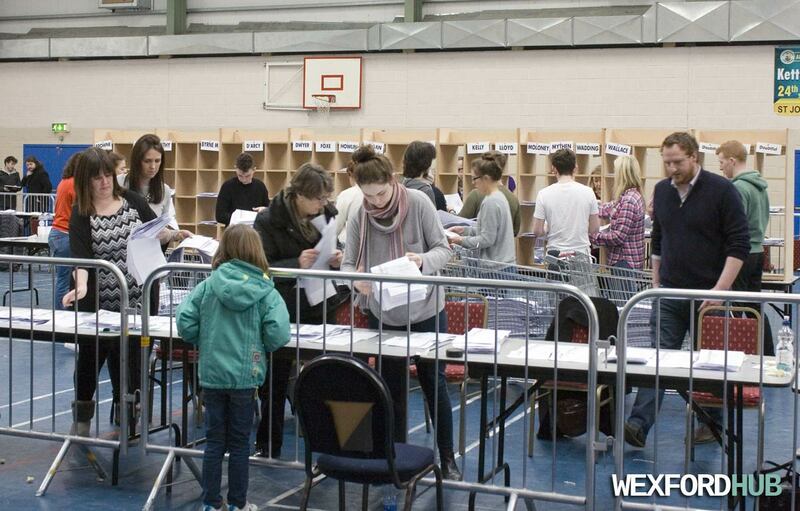 Photographs of the 2016 General Election count centre in Wexford. The count took place on Saturday, the 27th of February, 2016 in the St. Joseph's Club Community Centre. Labour candidate Brendan Howlin retained his seat by topping the poll. Fianna Fail's James Browne retained his father John Brown's seat by coming in second. Independent candidate Mick Wallace took the third seat after the 11th count. 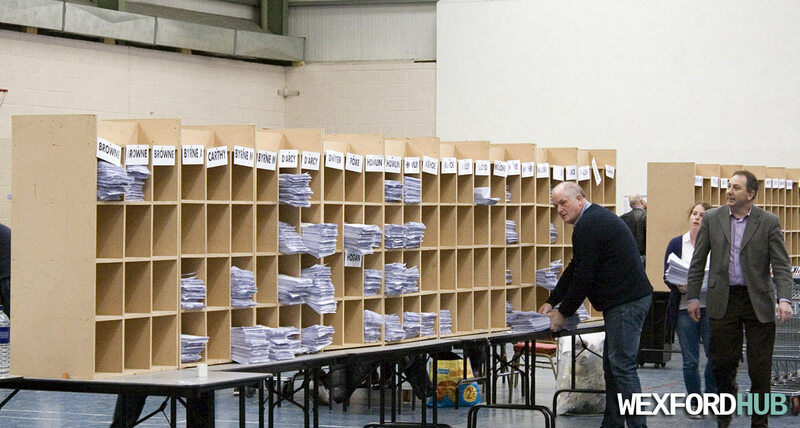 The last two seats were taken by Fine Gael candidates Michael D'Arcy and Paul Kehoe, who managed to edge out Sinn Fein's John Mythen by 31 votes. 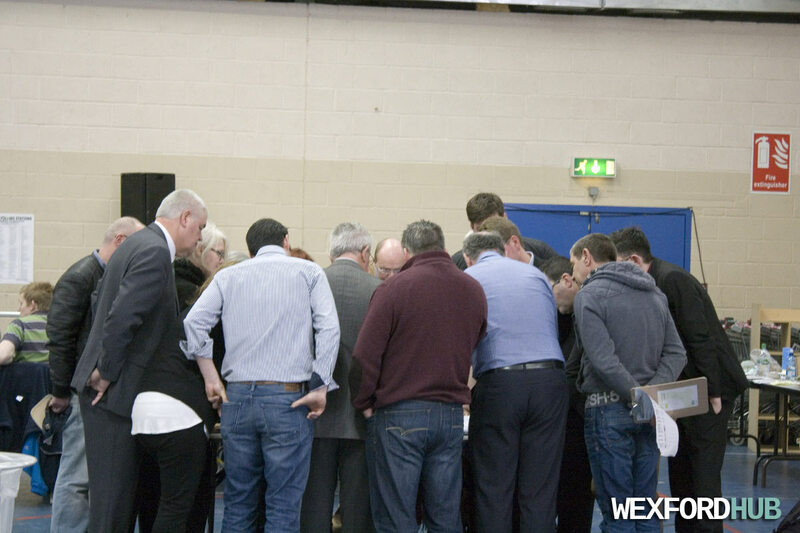 Candidates and candidate representatives in Wexford gather around the table to review spoilt votes. 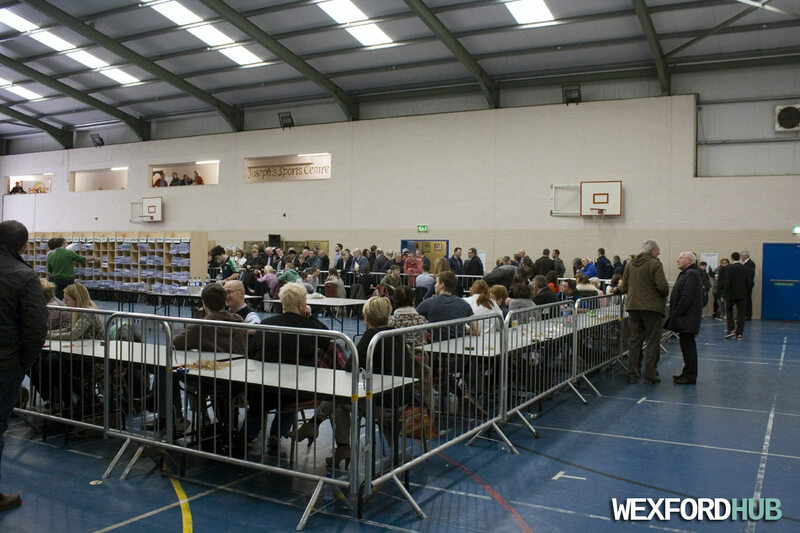 This was taken at the count centre in the St. Joseph's Club Community Centre in Wexford on Saturday, the 28th of February, 2016. Visible are Sinn Fein candidate Johnny Mythen, Fine Gael candidate Michael D'Arcy, Social Democrats candidate Leonard Kelly and Labour Cllr George Lawlor, who was representing Brendan Howlin. Funnily enough, one particular vote was spoiled because the voter decided to use fractions instead of numbers! 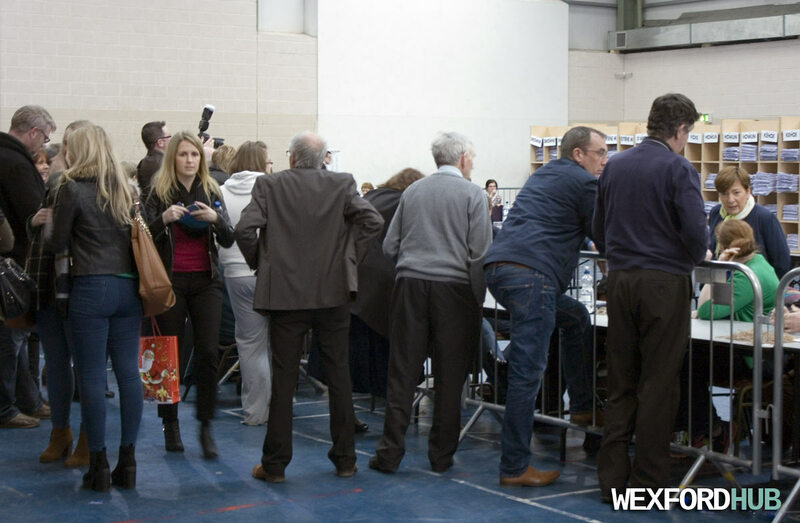 Wexford Social Democrats candidate Leonard Kelly at the 2016 General Election count centre in the St. Joseph's Club Community Centre. 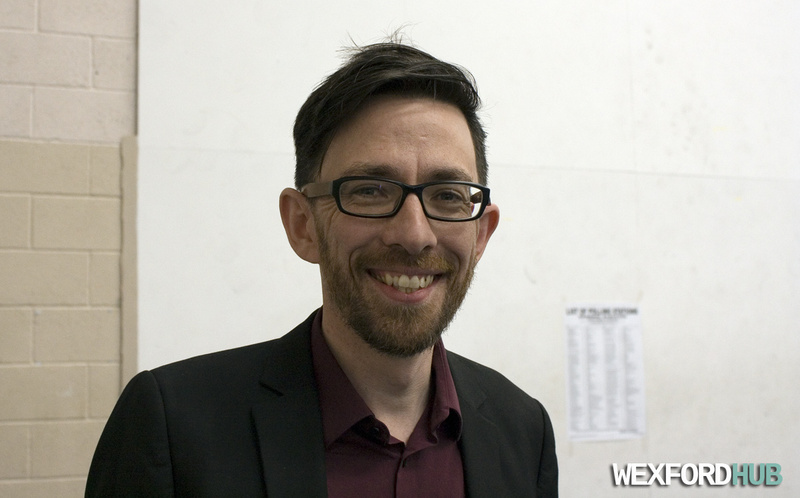 Mr Kelly was eliminated on the 7th count with 2,179 votes - a great improvement for a candidate that received 499 votes in the local elections in 2014. Photo date: 27th February 2016. 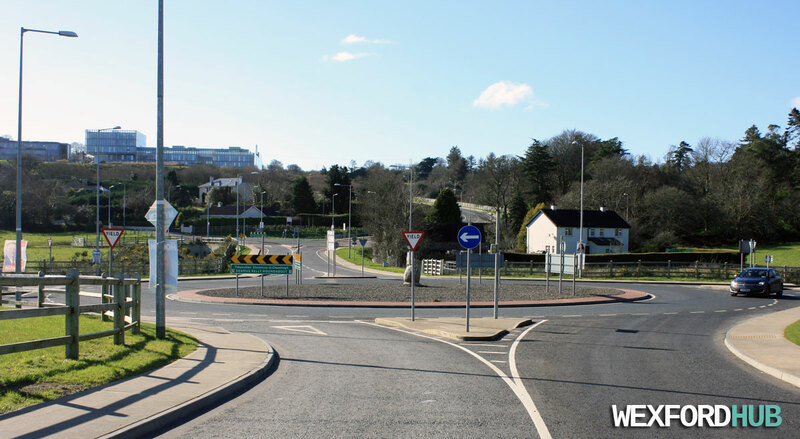 A photograph of the Seamus Kelly Roundabout, which is situated in the Carcur area of Wexford town - on the R730 regional road between Ferrycarrig and Wexford. 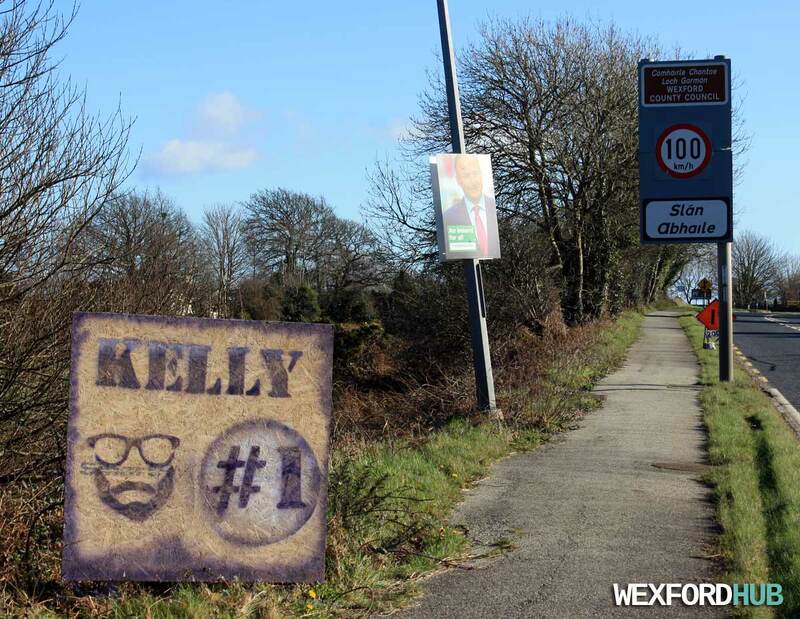 The roundabout is named after the late Seamus Kelly, who was the first Wexfordman to represent Ireland in rugby. The naming ceremony took place back in May of 2014. In the top left corner, you can see the Wexford County Council building in Carricklawn. A photograph of the ALDI supermarket on Newtown Road in Wexford town. ALDI is a global discount supermarket chain that is based in Essen, Germany. 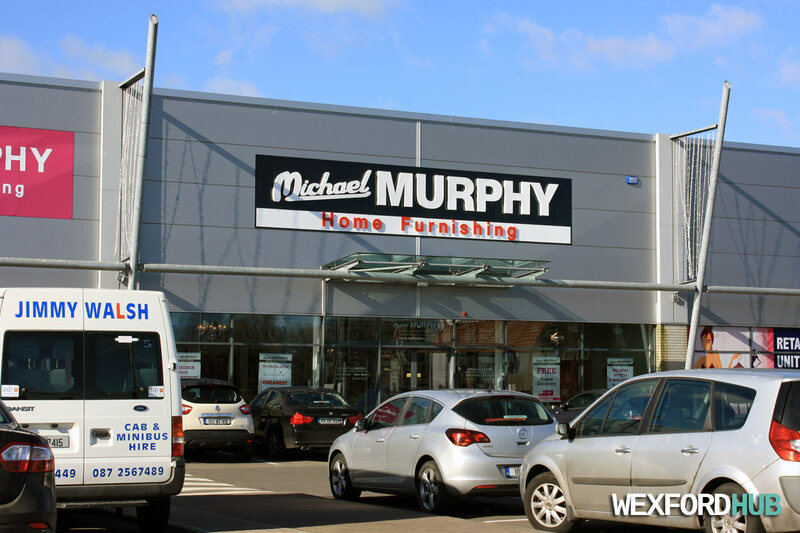 This particular store was opened in September of 2014. 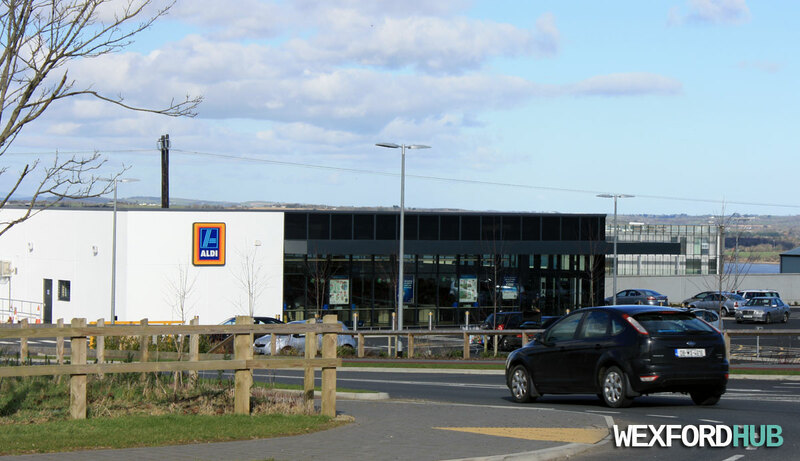 There are two other ALDI outlets in Wexford (located on Trinity Street and in Wexford Retail Park). In the background, you can see the Wexford County Council building. 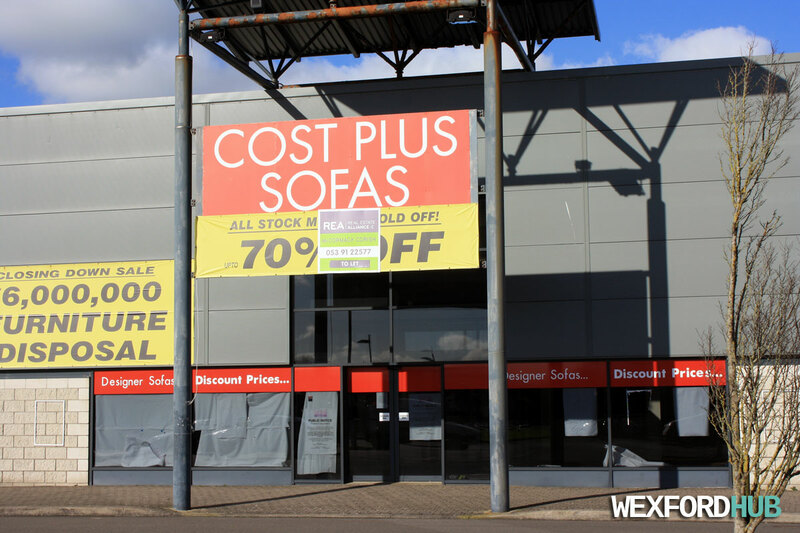 A photograph of the closed "Costa Plus Sofas" furniture store in Wexford Retail Park. In June of 2013, it was announced that the nationwide chain had decided to close a number of its stores in an attempt to "restructure" the business. The company had struggled throughout the recession, as consumer spending dwindled. A photograph of the Eishtec building in Drinagh, County Wexford. Eishtec is as an "outsourced contact centre" that employs a large number of people in the South East region. 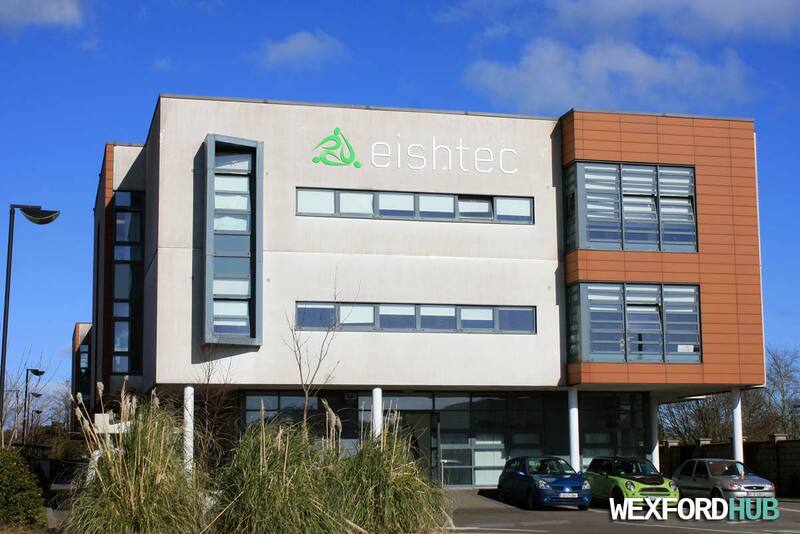 Eishtec also operates a call centre in Waterford. This was snapped on a sunny day in February of 2016. On the right, you can see the poster for Independent candidate Caroline Foxe. 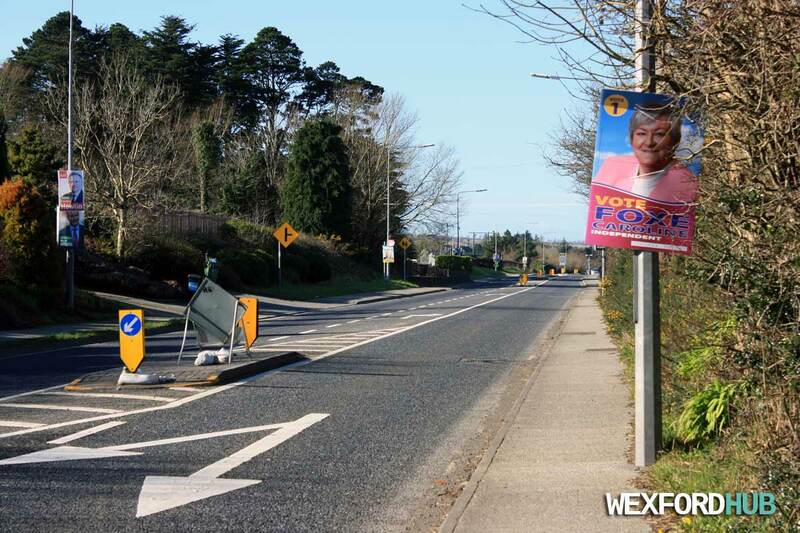 On the left, you can see two posters belonging to Labour's Brendan Howlin and Fianna Fail. This particular section of the N25 is 60km/hr as there are a number of residential entrances, as well as the entrance to Scoil Mhuire Barntown and Barntown Church. Taken on the 23rd of February, 2016.